One of the most frequent questions by all collectors in this hobby is “What’s the next comic book to shoot up in value?” When I was 10 years old, I clearly remember asking my local comic shop owner this same question. He replied with, “Kid, if I knew that, I wouldn’t be working here.” That sums up this hobby perfectly. Obviously, we never really know. Some of the most successful price jumps have been surprises. Alternatively, most can be assessed with common sense and a keen eye for market waves. While this isn’t fool proof, I’ll make my own educated guess on books you should be investing in now, tomorrow and for the near future. These aren’t quick flips nor will they be quick risers. These are your “fine wine” books that need time to age properly. So, with that said, let’s look into the first entry of this month’s Crystal Ball. 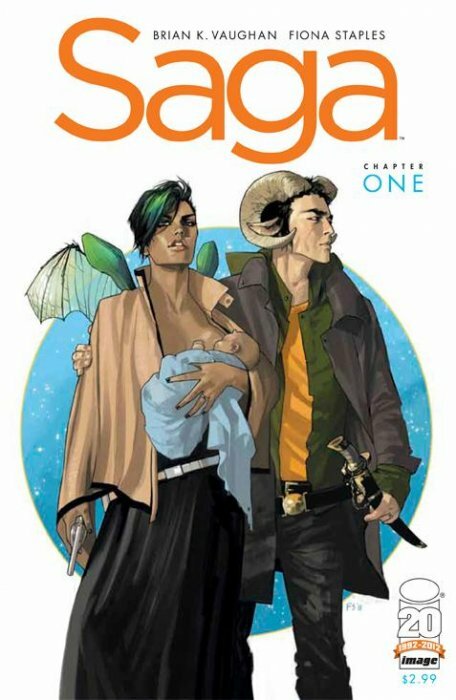 SAGA was released March 2012 to a rough 37,641 print run and continued on for 5 additional printings (see the bottom for the first issue print run info). Did you know that this is Image’s best selling book? Yep, even more so than the juggernaut known as THE WALKING DEAD. Looking at comichron, the most current Saga issue #36 had a print run of 49K and WD was about 67K. Sure, obviously the WD is selling more monthly issues. However, that gap was pretty tight over the past few years with the difference being less than 10K. But what makes Saga so profitable are the trade sales. 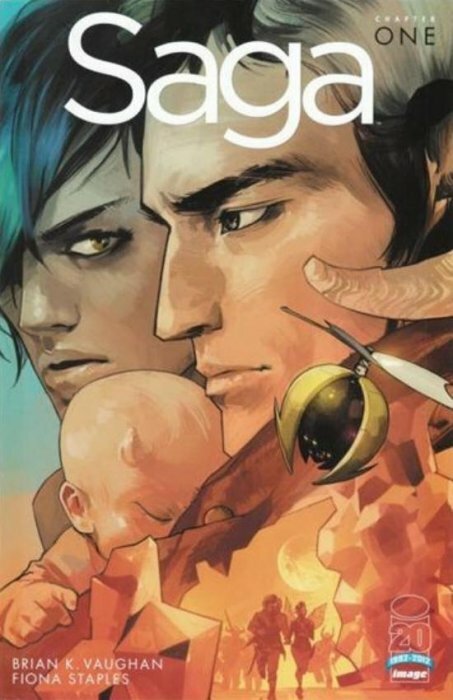 For example, Saga Vol. 5 TP 1st print had a print run of 29,387 (for comparison, in March 2016 WD Vol. 25 released to a 19K print run). Think about these numbers for a second: $14.99 price tag and 29K run. This trade will continue to see printing after printing after printing. And it has done just that; since September 2015 it’s be reprinted every single month, slowly dropping a few hundred as it goes. But it never disappears. All former volumes are still reprinted nearly every month. Saga Vol. 1 released in October 2012 and reached 120K copies less than a year later. THAT’S where all the money is coming from. Amazon has ranked Saga Vol. 6 as a “Best Seller” and it doesn’t even release until this July. Don’t believe the numbers? Just ask your comic shop what their (1) most consistent money making book is, (2) most consistently requested book and (3) what they most recommend to new comic readers. The answer will likely be Saga. In 2013 it won 3 Eisner Awards (Best Continuing Series, Best New Series and Best Writer) and 6 Harvey Awards (Best Writer, Best Artist, Best Color, Best New Series, Best Continuing or Limited Series, and Best Single Issue or Story), in 2014 it won 3 Eisners (Best Painter/Multimedia Artist, Best Writer, and Best Continuing Series) and 2 Eisners in 2015 (Best Continuing Series and Best Penciller/Inker). It’s absolutely the most celebrated comic on the shelf currently and quite possibly on its way to “of all time”. People like to use the phrase “it’s the next Walking Dead” for the most random new books. While its overuse is exhausting, if there’s any book that comes close, it’s SAGA. The market value for issue #1 is currently $125 raw, with the variant well over $800 raw (and raw copies for the RRP nearly never come up for sale). And while those are not easy entry prices, it’s really just the beginning. The term “unmake-able” has been thrown around in nearly every circle that engages in a “Should Saga be turned into content?” conversation. Even BKV has publicly expressed his preference in it not being turned into entertainment. However, I absolutely know that this is being shopped around Hollywood. Studios are paying attention to this property. For you “comic optioned” naysayers, let’s say it never gets turned into an entertainment property. First off, it’s beloved by fans, shops and critics. It’s award winning and still the best selling title for Image. To top it all off, it’s only in it’s infancy at issue #36. And where was Walking Dead at issue #36? Well, it definitely wasn’t an expensive book at all. In fact, it was probably about the same price if not less. We forget that WALKING DEAD wasn’t always a $1K+ book. In December 2009, WD #1 was $125/$150. In January 2010, when it was on issue #69, AMC announced it was officially going to be a show and made the value of the first issue jump to $250. The official AMC Frank Darabont 8 episode show order in May 2010 pushed it to $350. Even by November 2011, THE WALKING DEAD #1 could easily be bought for $400. By March 2012 (2 seasons in), around issue #83, WD #1 was a $700 book. It took 3 (3!!!) full seasons to finally break $1000 (and as a side note for those questioning other comic shows…. books DO go up if the show is a huge hit). Keeping ALL of that WD comparison in mind, Saga’s stride is even more steady and consistent, even without entertainment. Every few months, this first issue jumps $5-$10. Yes, if you’re flipping comics, that’s incredibly slow. However, it’s organic and fan driven. Books that have this special formula carry a level of security with it. So, yes, if this is never made into content and you wield a normal size level of patience, you will STILL see a strong return on your investment. Review time. Huge increase in profit with strong entertainment potential? Check. Fan/critical darling with steady and organic profitable growth? Check. It’s a no brainer. 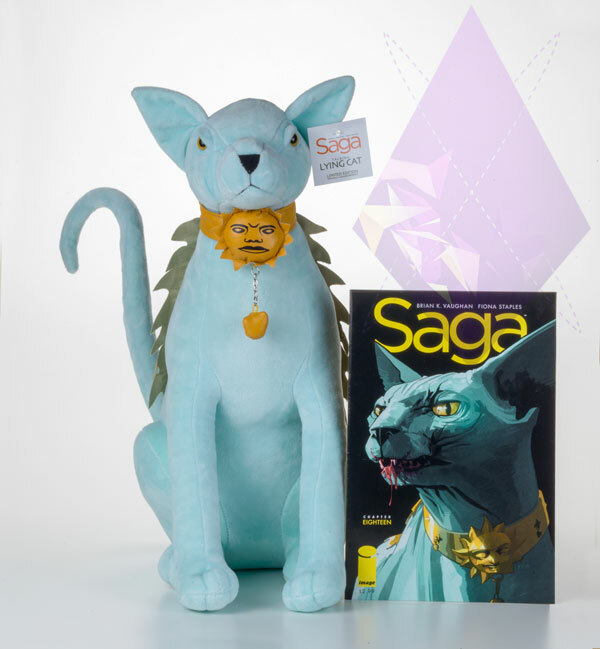 While the variant is already unreachable and at a price that most of us can’t “just sit on” (but could eventually be among the most expensive moderns), SAGA #1 and the next several issues (and subsequent printings) are books that should….. No, MUST be in your collection and should in no way be selling them right now. Hunt them, buy them, HOLD them and tuck them into your long box. 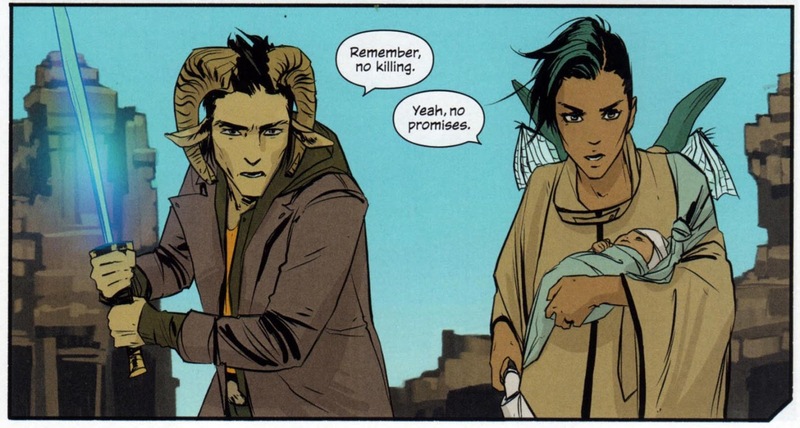 There’s no book with more potential than SAGA right now. My personal guess is that we will see it optioned in the next two years and on our TV screens in about 3 years. So, yes, if you want a true investment book and if you’re looking for an answer to “What book is going to be worth something?” or even an answer to “What’s the next Walking Dead?” this article’s answer is SAGA. The 2nd & 3rd print were both released in April. The combined print run that month was 9,641. The below is a very rough estimate as I simply divided them by half. Since they were printed around the same time, this is probably not too far off (unless they “tacked on” the 3rd quickly to fill last minute orders). There’s conflicting information out there from an interview with Image in 2012 that the 1st issue had combined printings of 70K copies. But the above numbers don’t reflect that. Reading an article ICv2 in May 2012, Image Publisher Eric Stephenson mentioned they’re “getting to the 70,000 mark”. The word “getting” seems vague and any amount could fall under that umbrella. For rarity, my vote goes to the 4th Print (with the 3rd print being a very strong contender if that April number wasn't an even split). March 8, 2015 Must Have Saga!!! Awesome article, and couldn’t agree more. Was surprised for the print run information on later prints. I passed on them many times because I had the first print, but now I’ll be on the lookout. Thanks! Great article, this has been one I’ve looked for but always passed on later prints. I’ll be grabbing one now. Great article. I agree – this is kind of a common sense book that doesn’t need a movie or tv announcement to increase in value. It’s just a great book that everyone talks about. Saga is a no brainer for long term investors. I’m glad I have issue 1 and the RRP variant. It was pricey but I know that I can always sell it for a profit if I ever need to. I sit on my RRP! :( GREAT ARTICLE MATT! An RRP is the number one book I really really want to get! Thanks for the likes folks! Fun read Matt. It’s definitely my favorite monthly read. Still need to get ahold of an RRP! Awesome article! You put in some great work on these articles and it’s much appreciated! Awesome write-up Matt! It has been feeling like Saga lost some steam this year. Thanks for the great reminder that it has not! Wow what an article. Could not agree more. This series is so good, it’s hard not to believe it will be optioned. Even if it doesn’t it will still continue to rise. Too many slabbed copies of the RRP for it to ever become “the most expensive modern” (and that would have been a long shot proposition regaedless). The fact that it is in fact a third printing of #1 will always hold it back in the long run as well. Fair enough JDR. It’s totally my own opinion. I’m basing that guess on the fact that slabbed 9.8’s sell for $1200 to $1400 with no speculation or entertainment news. The market has already decided that this is most valuable book in the series and will most likely never come down from that price. It will go up. The most expensive modern is dependent on it’s content development. That push would easily turn this into a $5k+ book. And maybe even higher. But, I get where you’re coming from. It’s a big what if to be the most expensive and it does have a way to go to get there. And yeah, I feel like every copy has been slabbed. How many stabbed copies are listed in the CGC census and for cbcs of the rrp? CBCS doesn’t have their census up yet. Coming soon. CGC shows 227 of the RRP as slabbed. And while I’m in there: the 1st print has 2345 graded. The lowest being a 5.5 ouch!! That was a poor choice. I agree it is a super cool book and the series is too notch. I’m just thinking about all of the other moderns that it would have to leapfrog to get there (not even counting other variants and RRPs) and that list is daunting. Totally true. It would have a lot of work to do. But I do think it has the potential. To your point, I didn’t want to focus on the variant too much as the affordable investment right now is in the 1st and subsequent printing. You’re right, the words “most expensive” is probably too big of a broad boast. I’ll edit it. Thanks! Don’t get me wrong I love this kind of enthusiasm when it comes to books. Totally JDR. No worries! You made an excellent point. And yeah, ASM 667, LOVE & WANT. This has to be one of the best spec articles ever written on Saga. A lot of useful info. Good job with this one! Great article! Looking forward to seeing how this all plays out. Great article! Very happy I lucked into 3rd and 4th prints. Just need a 2nd and 5th now.